Hey, for you rabid Tolkien fans (how many rabid fans are LEFT after the movie series?) I've posted some photos and a brief video of a completely handmade wooden box that I built back in the waning years of the 20th Century (the early 1990s). The nifty-keen thing about this box is that it has a secret compartment which is activated by a hidden mechanism.... intrigued? Take a look at the RingBoxx Photo Set or skip straight to the video of the hidden mechanism's secret activation. What's interesting is that today I discovered that I may have confused the runic letter 'H' for the runic letter 'W'.... did I? You are one creative dude... that's all I'm sayin. You should join the Rink of Pain this fall. Virtual Hosket needs you. We do need another token member from the Confederate Division. Very cool. The pic makes it look larger (6 or 8 inches square, like a jewelry box), and when your hand shot into the frame of the video I realized it was much smaller. I'm no longer a rabid Tolkien fan, but I still go through The Hobbit, the Trilogy, and The Silmarillion once a year, if not more. 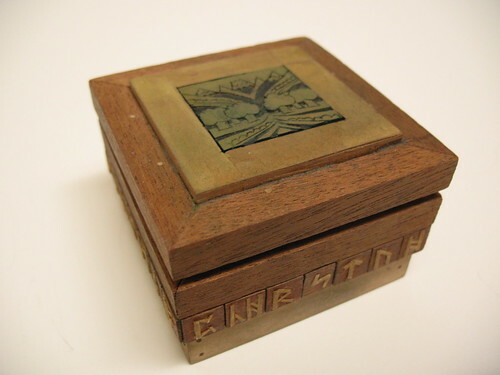 But that box looks really awesome, the engraving is one of my favorite Tolkien illustrations. I still go through The Hobbit, the Trilogy, and The Silmarillion once a year, if not more. I think you qualify for the rabid fan plan. Now with new low rates! I usually read the books about every 8 years or so.... but that was pre-trilogy. For now I'm good. Thanks! I've had 28 people watch the video!! I suppose there's a little ball inside it, that needs to be a special place in order for the box to open? It's just a simple catch, really. A hook that latches underneath something.... honestly, I can't remember how I engineered it. There are two copper pipes that act as rails, and a piece of wood which is pierced by two holes, through with the pipes fit. That piece of wood is lifted by a steel spring when the catch holding it in place is released. If you watch the video you'll see that I press the 'S' button back into place as I push the top back down. The spring assembly really provides a strong "ka-thunk" when you press that button in!! Oh, I thought it was like one of those maze boxes, as you kept tilting it around. That's a gorgeous box. I can't read the carvings, but they look gorgeous. But I pegged the central letter as the mechanism even from the still. Sits differently from all other letters. Probably worth a nice penny if you catch the right rabid ebay fans. Great stuff, Drew. I can't wait to see what else you built in your earlier years, only to stash away for a future Internet revival. OMG I remember this! But for some reason I didn't comment, last time. So, here it is: comment. Seriously, though, it's pretty awesome, and I'm not even a Tolkien fan (shocking, I know). Wow, how did I miss this the first time around? That is incredible! I personally would've made the ring compartment a little bigger and hide some "other" things in there. Would've been a great stash box, haha.